For those people who have been sleeping since March 2014, take notes and pay attention because I am literally sick and tired of repeating in vain that THE 2014 EBOLA OUTBREAK IS A PROVEN FRAUD. Let me repeat that one more time: THE 2014 EBOLA OUTBREAK IS A PROVEN FRAUD! First of all, there is no ebola in the very epicenter of the fraudulent outbreak. Do most people on this planet even understand what that means? 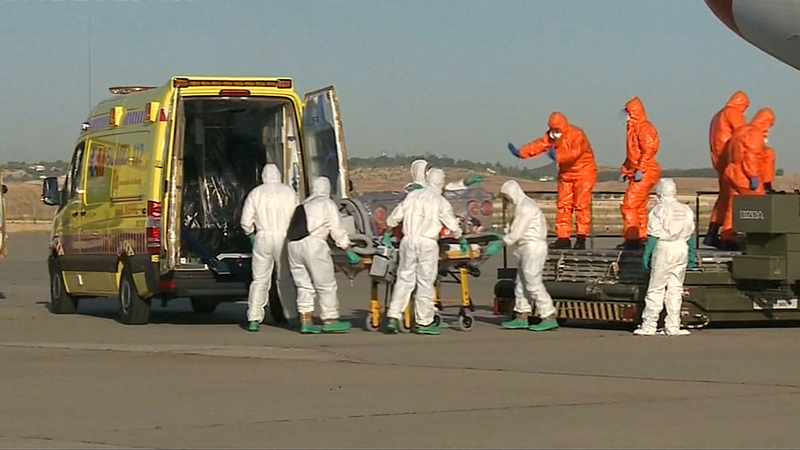 THERE ARE NO CASES OF EBOLA IN THE EPICENTER – THE SOURCE – OF THE OUTBREAK. That has been confirmed by the BBC TWICE. So the jive about natural cases of ebola in Guinea is a fabricated narrative to get you conditioned and afraid enough to accept enforced vaccinations. Moving on to the next pieces of evidence that prove that this ebola outbreak is A FRAUD on par with the man made global warming scam and the false war on terror, which are all as fake as the three latest ISIS beheadings videos. Just pay attention for a while and stop watching those reruns of Oprah, Big Brother and Idol. The official and mainstream reporting about 8 health representatives that were killed in Guinea on Tuesday – of which 3 UN World Health Organization reps had their throat slit, in the area of the EBOLA-FREE epicenter of the fraudulent 2014 outbreak, has all references to the presence of WHO representatives scrubbed from the online news articles and reports. What this means is just as clear and easy to understand as the words THERE ARE NO EBOLA CASES IN THE EPICENTER OF THE OUTBREAK. The fact that the United Nations wants all references to the WHO representatives in the Guinea delegation scrubbed from the web means that the UN does not want a true investigation there into what happened in Nzerekore, Guinea, where the 8 dead bodies were found in the septic tank of a town. Admitting that UN people were part of the delegation would require the UN itself to actually investigate the murder cases but the United Nations do not want any real investigations going on in the EBOLA-FREE epicenter of the fraudulent 2014 outbreak because the truth would be exposed and that would mean the END of this FAKED and HYPED UP ebola outbreak. It would also mean the end of dubious money transfers into the pockets and private bank accounts of big pharma like GSK, Ban ki Moon and his goon squads at the UN and the WHO. Moving on to the next pieces of evidence… DAILY MAIL FAIL. 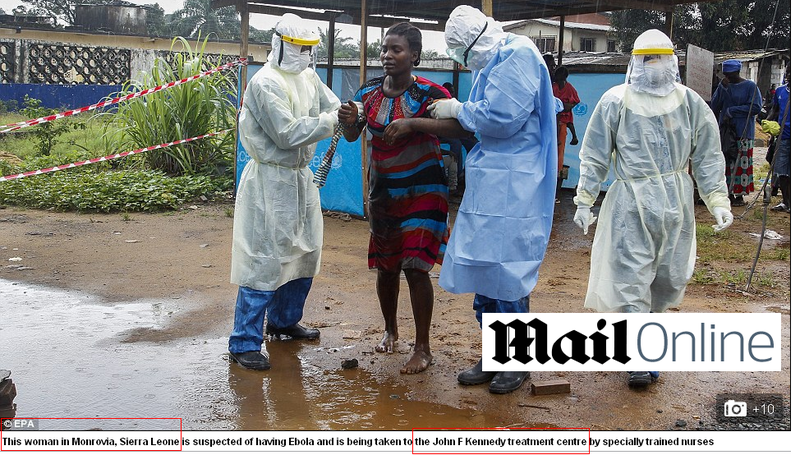 The pictorial of this article in the Daily Mail proves that they can not even keep up with the debunking of their official ebola narrative. Monrovia is NOT located in Sierra Leone, it is located in Liberia. So is the JFK Medical Center but according to the Mail Online, and everyone who has blindly copy-pasted this – and that are a lot of people and other news websites, both places are in Sierra Leone. What a fail. How desperate are they, one must ask? The fake character and the lies of this 2014 ebola scam are right in your faces staring at you all, over and over again, yet most of the folks out there around the world still believe the entire world is endangered by an ebola outbreak in Africa. Let me recap just one last time so you cannot miss what has been written here today. There are no ebola cases in the epicenter of the fabricated outbreak. This was admitted by the BBC, two times. 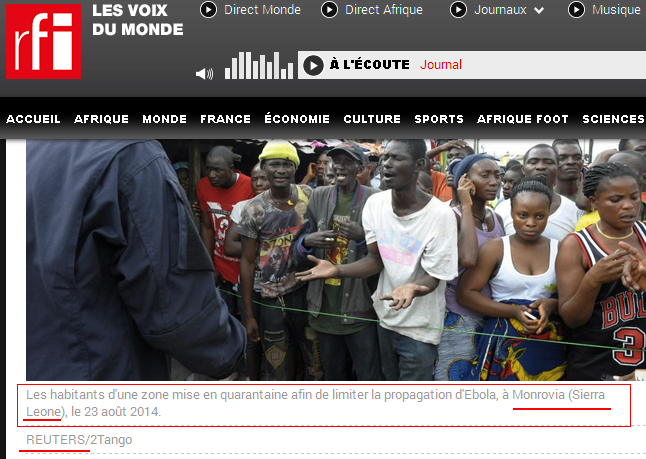 This means that no one had ebola in the very area where the fake outbreak started. 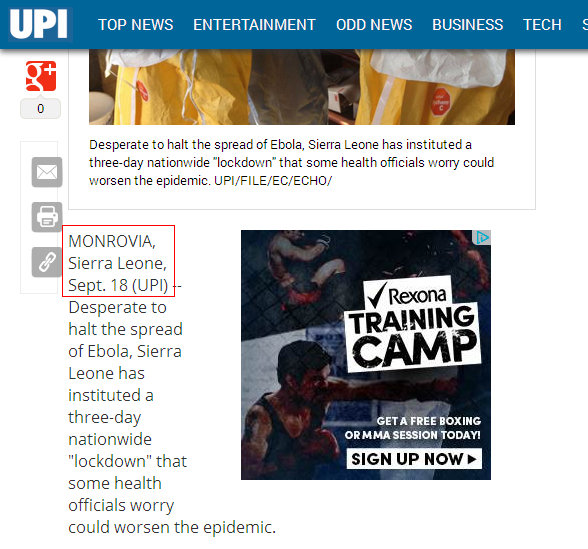 Monrovia is not located in Sierra Leone. Neither is the JFK Medical Center. 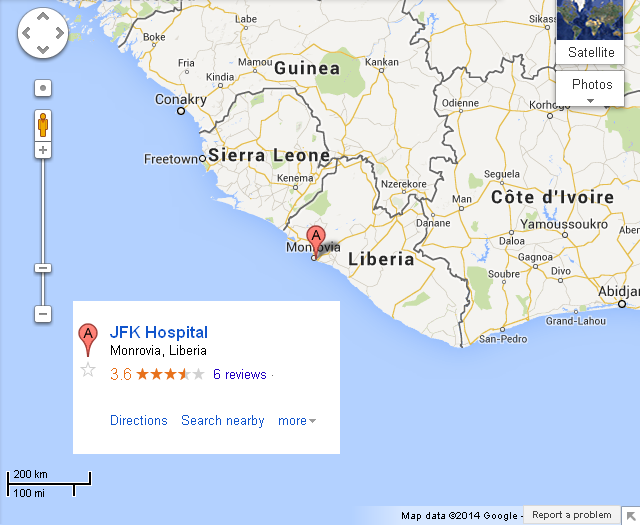 They are both located in Liberia. Yet Daily Mail, UPI, RFI and several others will make you believe they are located in Sierra Leone. The UN World Health Organization is scrubbing all references to their representatives who had their throats slit in Guinea in the very area of the fabled epicenter of the outbreak. Scrubbed because if not then it would require the United Nations to launch a real investigation into the murders. That would reveal eventually that the UN and WHO have been spinning lies all along about the 2014 ebola outbreak. Yes, for the money yes! All I can do is point out the already obvious. Those who do not want to accept the fact that they have been lied to BIG TIME about the fabled ebola outbreak of this year, well, there is little hope left for those people then. They will literally believe it when one day the New York Times will tell them that Mars is going to collapse in their back yards. So be sure to spread this report with everyone you know. That is the least we can do together to stop this madness from continuing any longer. Two days ago, on August 31, I reported as the first and still only one about the proven deception regarding the current ebola outbreak that is falsely being branded as the largest in history. As the seemingly very troubled alternative media refuses to and the corporative-mouthpiece mainstream media isn’t allowed to report on the already exposed ebola fraud of 2014 I will step u my efforts to further take down the entire ebola scam of this year because by now it has become more than obvious that the people – the general public – are being taken for a scary vaccine ride on the sidetracks of reality. Earlier I documented how the World Health Organization was exposed by the BBC – of all players – for producing/fabricating FAKE ebola-related death figures for Gueckedou in Nzerekore, Guinea. Gueckedou is allegedly near or even in the epicenter of this year’s ebola outbreak but has “miraculously remained free of Ebola so far,” according to the BBC and its correspondent Alhassan Sillah. You may think that this is just a one-time and honest mistake that has occurred at the BBC headquarters but that is easily proven to not be the case. In fact the exact same sentence is reprinted in at least two different BBC articles, one being “Ebola outbreak: Senegal confirms first case” as described here and the other one being “Ebola: Guineans riot in Nzerekore over disinfectant” as archived here. Both articles were published by the BBC on August 29, 2014. However, where the BBC reports in one case that there “miraculously” is no ebola in the town of Gueckedou, located in the city of Nzerekore in Guinea, the BBC reports in a second case that the entire city (town) of Nzerekore – Guinea’s second-biggest city – “has miraculously remained free of Ebola so far.” Thus, it is easily proven that the official but FALSE narrative, as hatched by the United Nations and the World Health Organization brigands and as endlessly and desperately parroted by BOTH mainstream and alternative media outlets, is nothing but that… FABRICATED. Including the number of deaths of course, which is why this alleged outbreak can’t possibly be described as a spontaneous/natural outbreak nor the biggest in history. More and more it is becoming clear and obvious that the current ebola wave was triggered on purpose, likely by US bio warfare guys in cooperation with the highest levels of global governance addict… the United Nations. Several indications, including as described above, can attest that this fabricated 2014 ebola outbreak campaign is but a finalizing propaganda test run during which the final glitches are being addressed and tracked in order for a next ebola or other (zombie) virus campaign to be extremely effective in relation to the spreading of FALSE information and data and in relation to getting the necessary pharma players (production, distribution, funding) on the same page. 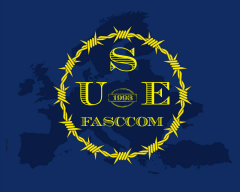 It really is no coincidence that the UN/WHO come up with a number such as 20,000 – possible infected persons when nothing is being done right now (as they say it) in this purposely triggered outbreak – the number not only instills fear and panic in the minds of common folks and corrupt, pervert heads of state and government – the number magically coincides with Japan’s delivery of 20,000 doses of Favipiravir to Nigeria (“Nigeria to get Ebola drug from Japan“). 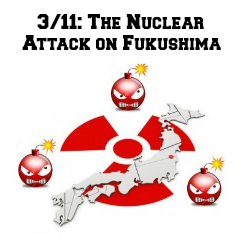 This indicates indeed that the number is being dropped in the media publications to on one hand justify and enforce more financial contributions from all governments and eventually the taxpayers themselves (who will eventually also finance their own fatal injections) and on the other hand to gradually pump up the fake death toll in order to keep the general public afraid enough so that the WHO and pharma companies can finally roll out a major and global vaccination program. The fact that Ghana is now being declared the new UN base from where the purposely triggered 2014 ebola outbreak will be further coordinated shows that the global ebola propaganda campaign of the UN is being taken to its next level. All of a sudden it becomes crystal clear why the United Nations and ALL its parrots in the mainstream and alternative channels are working overtime in their desperate efforts to make you believe that you should be awfully worried about the 2014 ebola outbreak, without telling you that it was triggered on purpose and that the death toll numbers are FAKE. The more worried people are, the easier they will allow their governments to support, fund and roll out globalist “measures” even when these measures include enforced experimental vaccinations and “cures.” Which is why it is always advised to reread “What You Should REALLY Know About Parvo, Ebola and Vitamin C,” from time to time. In addition, all of the reported suspected cases of ebola in Europe (Belgium, Sweden,…) have shown to be no cases of ebola at all, maybe except for the one in the UK which still is an advertising campaign for ZMapp, that is all mainstream-reported news by the way, yet the fear has been instilled in the general public and that was the sole purpose of those fear mongering reports in the first place. So, when the ebola-related death numbers of Guinea (Gueckedou/Nzerekore) are fabricated by the UN and the WHO how much of the other numbers is real and factual? How many of those numbers have been crafted too by the WHO apparatchiks? On top of this the CFR (Council on Foreign Relations) and its freak show Laurie Garrett openly admit they want to scare you more in order to get everyone on the same fabricated ebola reality page. Conclusion, once again it is all about the money and global governance promotion. It has in fact little or nothing to do with ebola itself nor with finding an official cure for it. Just milk the tax cows and control the slave herd. Not entirely convinced yet about this? 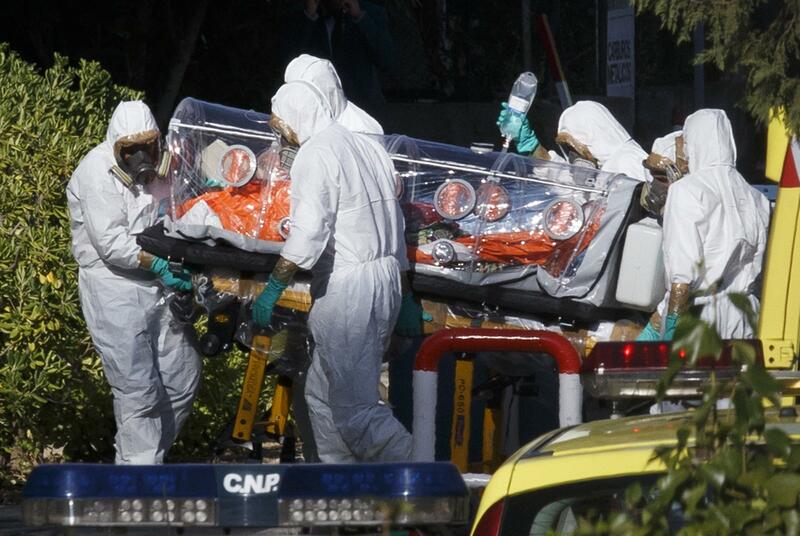 What if I told you that at this very moment millions of people are being shown staged scenes of imaginary ebola cases, that right now there are ebola drills (Spain,…) going on that are being advertised and described as real cases and repatriations? Here we have actual pictures and video footage released by the media [1, 2] with which they try to sell the story of a returning Spanish patient allegedly infected with ebola during his stay in Africa. The only problem is that the stretcher is EMPTY. It is EMPTY as they upload the imaginary patient into the ambulance at the airport and it is EMPTY when they arrive with the imaginary patient at the hospital. It is EMPTY because it was a drill! !